The San Francisco Giants beat the Washington Nationals 3-2 to advance to their third NLCS in the last five years. The Giants have now won 11 of their last 12 postseason games. Ryan Vogelsong pitched 5 2/3 innings only giving up one run on hits. Vogelsong had an awful September going 0-4 in five starts and he hadn’t pitched since September 26, but he redeemed himself for his past few outings. 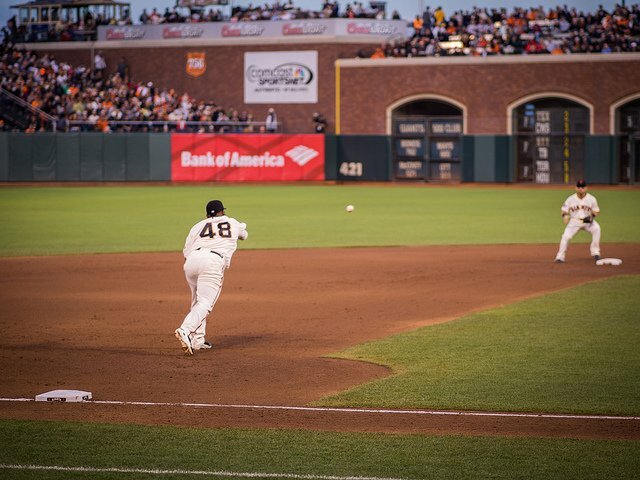 Joe Panik scored the go-ahead run for the Giants in the seventh inning on Aaron Barrett’s wild pitch with the bases loaded. Hunter Pence also had a key defensive play to keep the Nationals from starting a rally in the sixth inning. Sergio Romo pitched a perfect eight and Santiago Casilla pitched a scoreless ninth, but he put the potential tying run on with two outs, when he walked Bryce Harper. Casilla then got Wilson Ramos to ground out to end the game and any hopes for a Washington comeback. All three of the Nationals losses in the series came by one run. Game 2 went 18 innings, with the Giants winning 2-1 and that gave them a 2-0 series lead. Washington offense struggled the whole series, their offense is what led them to the NL East title and the best record in the National League at 96-66. Vogelsong didn’t allow a hit until the fifth inning, when Ian Desmond leadoff the inning with a single. Harper then came up and hit a double down the left field line to drive Desmond in for Washington first run. Harper also hit his third home run of the series into McCovey Cove in the seventh inning. It was the 104th splash into McCovey in the 15 year AT&T Park and it was the third postseason home run. Rick Ankiel was the last to do it for the Braves in the 2010 NLDS. Gio Gonzalez pitched four innings giving up four hits and two unearned runs. Gonzalez loaded the bases in the second and had a throwing error that extended the inning. The Giants will play the Cardinals in St. Louis on Saturday. St. Louis will put Adam Wainwright on the mound, the Giants have yet to announce, but I’m pretty sure they will go with their ace Madison Bumgarner. San Francisco has won the World Series in their last two postseason appearances.